30 miles off the coast of Cape Cod, a New England enclave is gearing up for spring. Every year during the last week in April, Nantucket hosts a colorful fête to celebrate the approaching season and symbolize the island's reawakening after a long Northeast winter. True to its name, the Daffodil Festival — or “Daffy Day,” as it’s affectionately dubbed by locals — is synchronized to millions of yellow flowers unfurling from their slumbers in the thawing ground. The annual tradition started in 1974 when Jean MacAusland, a Nantucket resident and former publisher of Gourmet magazine, had the idea to amplify the island’s springtime beauty. Apart from organizing an annual flower show sponsored by the American Daffodil Society, MacAusland enlisted the help of landscapers and friends to plant one million daffodil bulbs throughout the island. As Hjulstrom explains, daffodils are the perfect flower to thrive on Nantucket because they are one of the few unappetizing plants to the island’s flourishing deer population. And because the flowers are self-propagating (meaning they reproduce on their own), springtime now bears witness to millions of vibrant blossoms emerging like clockwork across the landscape each April and May. Now preparing for its 45th consecutive run, the Daffodil Festival incorporates an annual flower show at Bartlett’s Ocean View Farm (including daffodil displays from all over the country), as well as an array of other spirited festivities held throughout the long weekend. And for non-residents wishing to experience the springtime essence of Nantucket, the island waits just a Tradewind flight away from the New England coast. The lively tradition has certainly made an impact on residents like Tim Ehrenberg, who moved to the island with his husband in 2013 and now owns Brand New - Nantucket, a marketing consultancy for local businesses and non-profits. 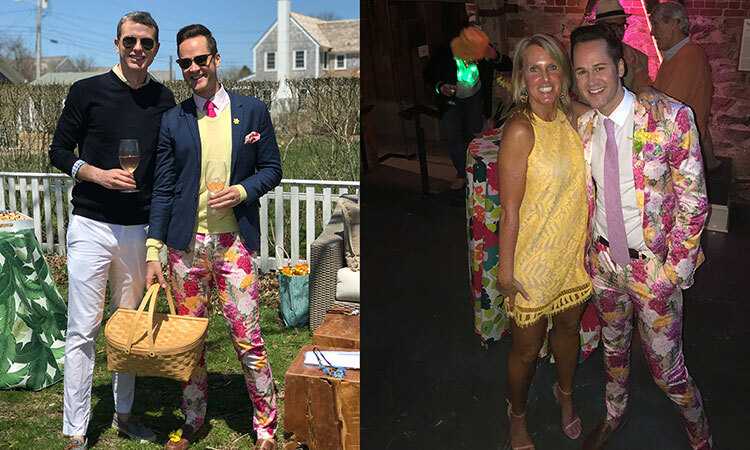 As a newcomer to Nantucket, Ehrenberg hadn’t heard of the Daffodil Festival until someone asked him if he had his outfit ready the week before. Adding to the spectacle of costumed locals is the antique car parade that crawls down the cobblestoned Main Street. Held on the Saturday of each festival, the tradition showcases up to 120 classic vehicles decked out in the lemon-hued blossoms, all in eager competition for the “Best in Show” trophy. When cars finish the downtown parade, most of them converge on the eastern end of the island to a town called ‘Sconset before parking for individually themed tailgate picnics, which are judged on their elaborateness and creativity. Back in downtown Nantucket, the weekend celebration continues with a rolling roster of events including a Daffy Hat competition and dog parade, where residents bring their florally costumed canines for a festive procession and contest benefitting the Nantucket Island Safe Harbor for Animals. Here, as local shops reopen their doors for the impending high-season, almost every window is adorned with flashy flower motifs. The weekend lineup also features several daytime tours and nightly ghost walks for visitors to stroll around Nantucket and savor tales from its storied past dating back to 1641. And just a short walk from downtown, on Children’s Beach, festival organizers have begun to host a variety of family-style events such as the Children’s Bicycle Parade, where youngsters decorate their bikes with daffodils before pedaling through a designated course near the surf. 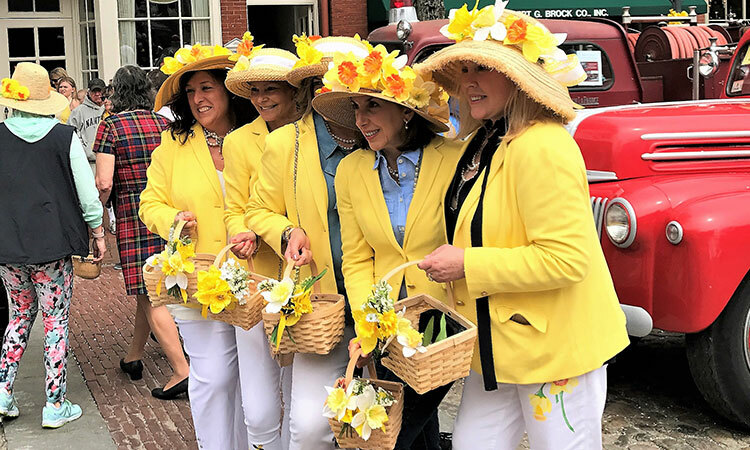 As Nantucket’s spirit comes alive with the festival each spring, it reanimates to a backdrop of umpteen daffodils, either sprouting from its verdant landscape or plucked and placed in artful fashion. While the original one million bulbs (and their offspring) can be seen year after year in full force, additional bulbs are also put in the ground each season by Palliative & Supportive Care of Nantucket. The specialized healthcare non-profit appoints students from the New School on Nantucket to symbolically plant flowers every year in honor of people who have passed on. Tradewind Aviation operates daily shuttle flights to Nantucket from late April through early December, as well as private charter flights year-round.